The LaPerm is a medium sized muscular cat with suprising weight for its size. They should not be short, stocky nor long and elegant. The head is medium sized and in proportion to the body. The wedge is broad with rounded contours. The forehead should be a flat plane to the top of the head with a smooth gentle curve over the top of the head leading into the neck. The nose is broad, moderate in length with a slight concave curve. The muzzle and the whisker pads must be full, round and prominent with a definite muzzle break. Ears are medium sized, slightly flared, and wide at the base with rounded tips. They are set moderately wide apart and are a continuation of the wedge. The ears must be well furnished with curly tufts at the lower edge of the ears. Tufts are desirable. Eyes are almond shaped, medium to large that are expressive and set moderately far apart. The eyes must slant towards the base of the ear. Long haired LaPerms have a medium-long to long coat with a ruff on the neck at maturity. The tail is plumed with some curling. Short haired LaPerms have a short to medium coat with no ruff. The tail can be wavy and is described as a bottle brush. The coat has a unique texture amongst Rex breeds, springy and textured. Coats should not be wiry but be loose, bouncy and stand away from the body. The longest and tightest curls are found in the ruff and at the base of the ear. 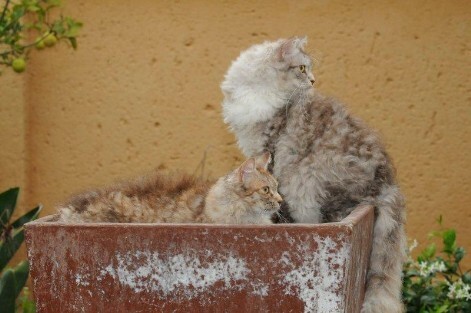 One of the breed characteristics is that no two LaPerms ever have exactly the same coat; each will have its own unique texture and degree of softness. The LaPerm is a very low maintenance breed, with very little to no grooming required. Whilst breeding cats can often loose copious amounts of hair, once neutered or spayed the coat usually remains quite stable. Often less hair is shed than "normal" coated breeds. 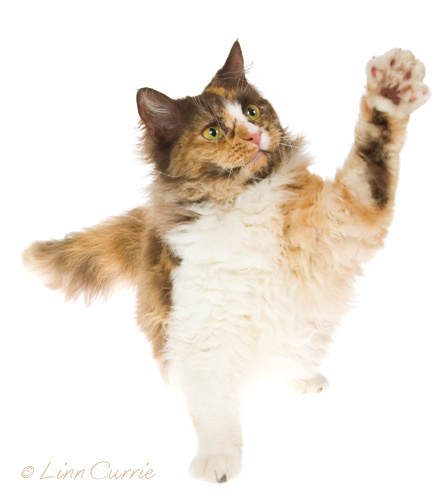 The LaPerm remains one of the healthiest breeds of cat, with no known hereditary problems afflicting the breed. Outcrossing to increase the gene pool has provided hybrid vigour. 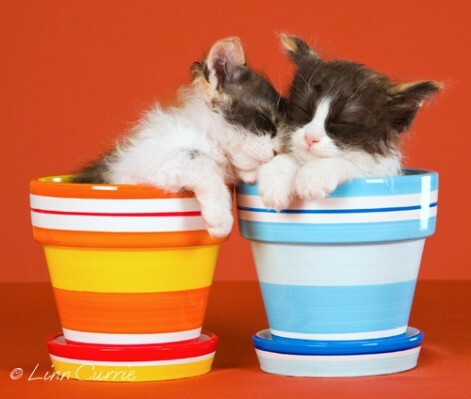 Breeding LaPerms are rarely fraught with problems; kittens are nearly always born with strong weights, good health and grow rapidly with no negative repercussions. Fatalities in young kittens are uncommon.